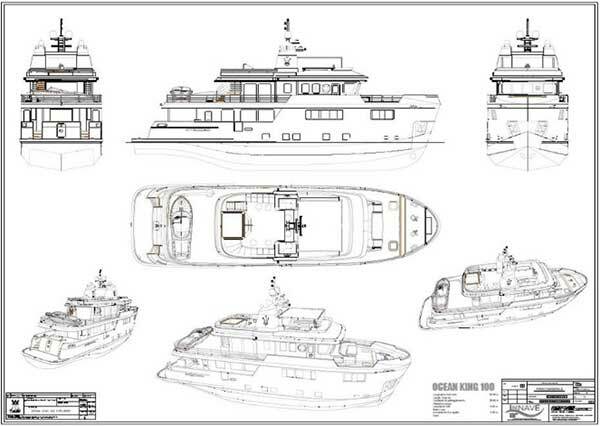 All Ocean Yachts is proud to announce the OCEAN KING Americana AO (All Ocean), the first in a new line of Ocean King designs created in collaboration with All Ocean Yachts. The Ocean King 100' Americana has been redesigned, tailored to fit the needs of the North and South American market with all the features needed for world cruising. There is an option to install a hybrid power system that allows for zero emission operation and silent running, or at anchor operation. The hybrid system further extends the already impressive cruising range. The OK110A has a full beam master plus 3 guest staterooms on the lower deck and a convertible sky lounge that changes into a VIP guest queen stateroom. There is an oversized swim platform with direct access to the lazarette for ease of watersports use and the aft deck has a comfortable dining table for 8 to 10 persons. You enter the main saloon via dual doors to an expansive space with lounging for 8 to 10 and a dedicated dining area for the same. Forward of this area to port is access to the lower deck, bridge deck and day head. This area is cleverly laid out so that crew can reach the lower guest area for service and can also transit to the bridge without being in guest areas. The day head is also separate from the guest zone. 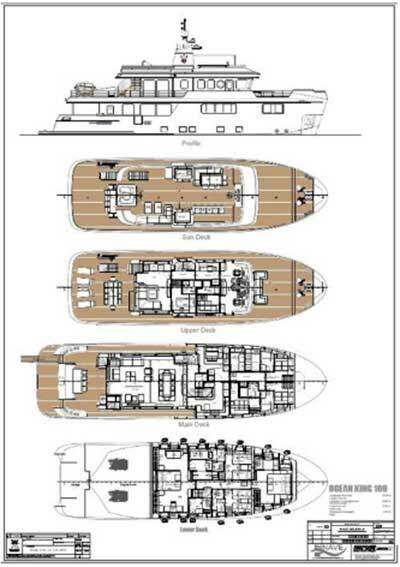 To the starboard side is access to the large galley with extensive storage and substantial counter space. There is direct access from the side deck to the galley to facilitate the volume of provisioning needed for long range cruising. To the port side of the galley is a large crew lounge with full amenities and direct deck access. Forward of the lounge area to port is a large pantry with additional refrigeration and freezers that can fit an optional walking cooler/freezer. Next forward is something rarely found on a vessel of this size and is truly useful, a full size laundry area with 3 sets of full size washers and dryers plus space for a roller ironing machine and storage. This area also has 3 crew cabins for up to 5 crew, and a captain's cabin is located behind the wheelhouse. This allows for a great deal of flexibility with regards to operation of the vessel with 4 to 6 crew. The 3rd single crew cabin can be used for a nanny, a dive or fishing guide, other temporary crew as needed for long passages or additional service. The lower deck of the Americana has been redesigned to have an expansive full beam master with oversize king bed, extensive closet and drawer space plus his and her heads. Both the heads are generous in size. Her head has a full size tub shower and separate toilet room with option for bidet. The his has a large shower. The total square footage found in this stateroom is more typical of a 125' vessel. Forward of the master to port is a guest cabin with a double bed and a US full size single bed; there is an option for a center line queen or a Pullman berth. The head is comfortable with an oversized shower. To port is a second twin cabin with US full size single beds with ensuite head with oversized shower. There is an option for a Pullman berth. Forward of the twin cabins is a VIP with center line king bed, large closet space and head with oversized shower. The comfortable stairs from the main deck up to the bridge deck land in the lobby that separates the bridge working area forward from the guest area aft. Going forward you walk through a fully equipped radio room/ship's office, then into a well-equipped bridge with excellent visibility laid out in a professional manner with centerline helm chair, two watch chairs and an aft guest settee. There is a comfortable captain's cabin located aft to starboard with ensuite head. Going aft from the foyer you come to a large sky lounge/AV room with full wet bar, L shaped settee and TV. Forward of the sky lounge is a comfortable office/lounge space with full head and hanging locker. The lounge has an option for a fold out single bed, making it into a comfortable single cabin, or the large settee in the sky lounge can transform into a queen bed and the entire area changes into a spacious VIP stateroom with sitting room. 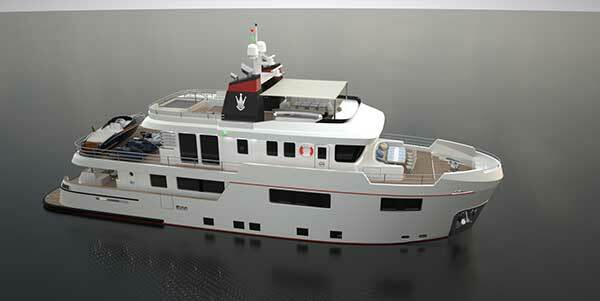 Aft of the sky lounge is a large boat deck which can carry a 23' plus tender and a smaller crew tender. The crane can reach up to the fly bridge deck should you wish to carry additional toys. The fly bridge deck is reached from stairs on the port side that lead to a truly magnificent space. There is a hot tub, large sunning settee, full sit down bar, BBQ, table for 10 people and full helm station. This area has a number of optional layouts and features including a 3rd day head. 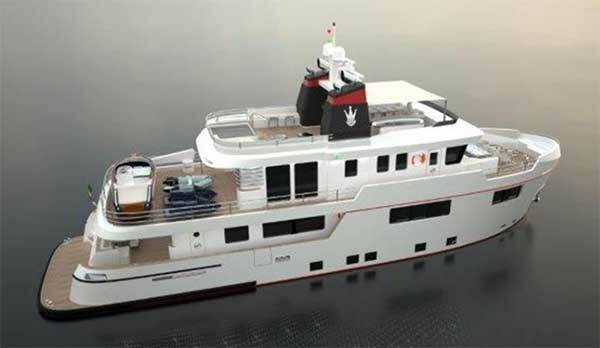 One option is to move the hot tub to the foredeck, replacing the present settee/sunbed and allowing for more toys or sunning space. 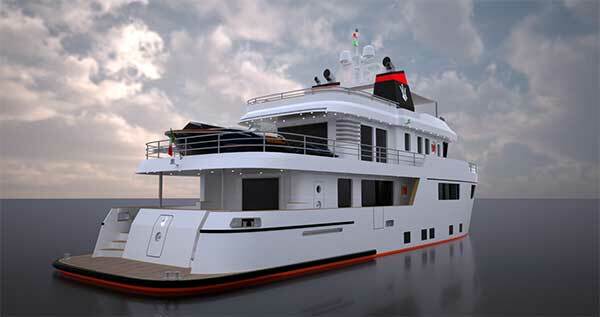 The Ocean King 100' Americana has the space sleep up to 13 guests and 6 crew in comfort and can carry the resources to supply them for extended times at sea and in remote areas. You can entertain large groups for the day or a few family and friends for months. 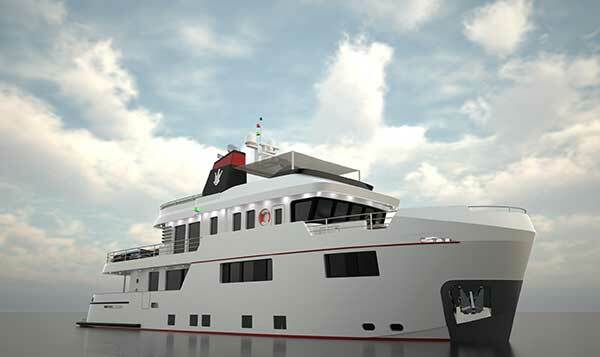 Her large professional engine room is fully equipped with commercial equipment for longevity and ease of upkeep. The Ocean King Americana is a vessel for all occasions and all oceans. Please Contact John DeCaro for more information.